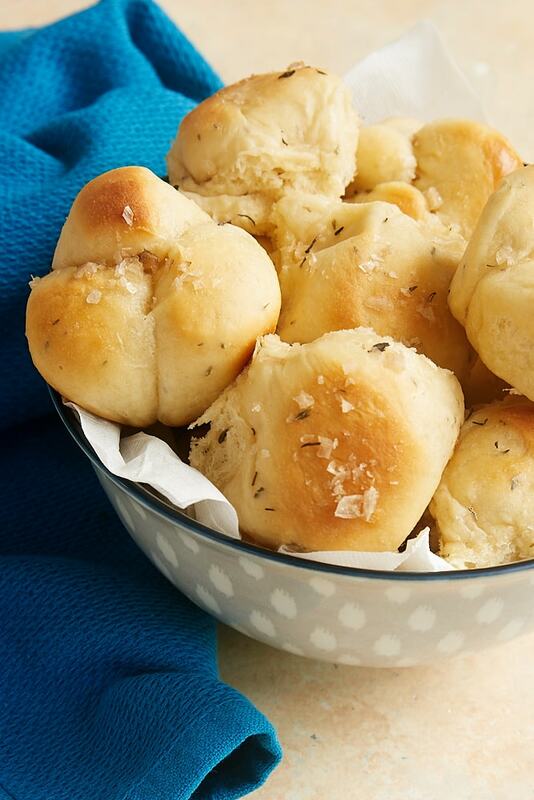 Smoked Salt and Thyme Brown and Serve Rolls are easy to make and so full of flavor. A favorite make ahead rolls recipe! When I first started baking, I was so intimidated by baking yeast breads. Since then, my bread baking skills have definitely improved, but I still lean toward the simpler yeast bread recipes. With less work required, I’m far more likely to make homemade bread than if I were using a complicated recipe. 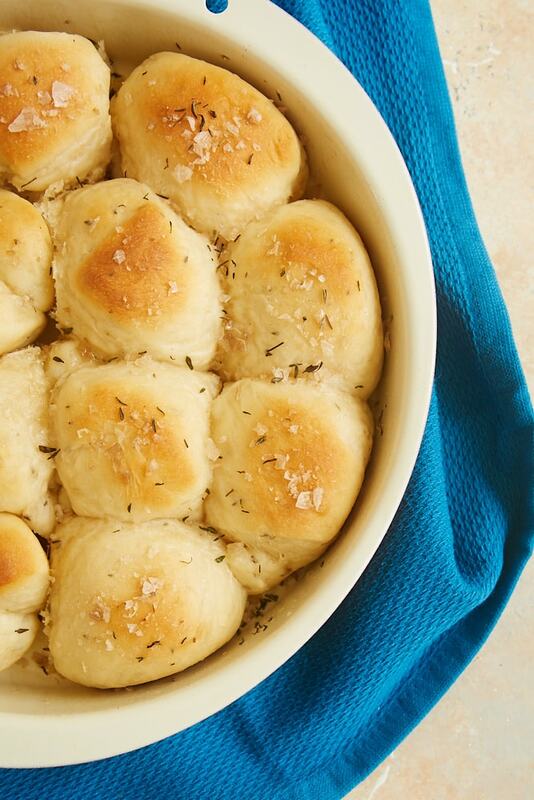 That brings us to these Smoked Salt and Thyme Brown and Serve Rolls. Of course, the very best thing about brown and serve rolls is that you can partially bake the rolls and then they just need a brief oven stint when you’re ready to serve them. That makes them the perfect make-ahead dinner bread for holidays and other occasions when you want to do as much in advance as possible. They’re also great for having in your freezer when you want a few rolls to go with your no-occasion meal. If you’re getting ahead with your baking, these rolls can be refrigerated for up to a week or frozen for up to a month before the last bit of baking time. If you go the frozen route, just remember to thaw them before baking. I usually store them in zip-top bags, and then just place them on a baking sheet (great for just a few) or in a cake pan (for a dozen per pan) when I’m ready to bake them. My biggest tip I can give you is about portioning the dough. Trust me when I say that a digital scale that measures in grams is your best friend for this. I like to weigh all of the dough first to make two equal portions. Then it’s simple to take the weight of a portion, divide it by 12, and then weigh each portion of dough to get a dozen evenly sized rolls. If you’re making classic rolls shapes, then you’re ready to shape them into a ball. For cloverleaf rolls, you’ll need to divide those portions again to get 3 little bits of dough to make that shape. On their own, these rolls are irresistibly soft and wonderfully delicious. But I just love the addition of smoked salt and thyme to dial things up just a bit. I am usually not shy about tweaking different combinations of spices, and this combination is one of my favorites. Of course, you can use regular sea salt or plain table salt if you like. It’s simple to change the spices to suit your taste. Once these rolls have baked the second time, do yourself a favor and brush a little melted butter on top of them while they’re still hot. I find that about a tablespoon of butter per dozen rolls is just right for me. Then sprinkle on a few pinches of salt and thyme to dress them up a little and add a bit more flavor. So good! Find more yeast bread recipes in the Recipe Index. 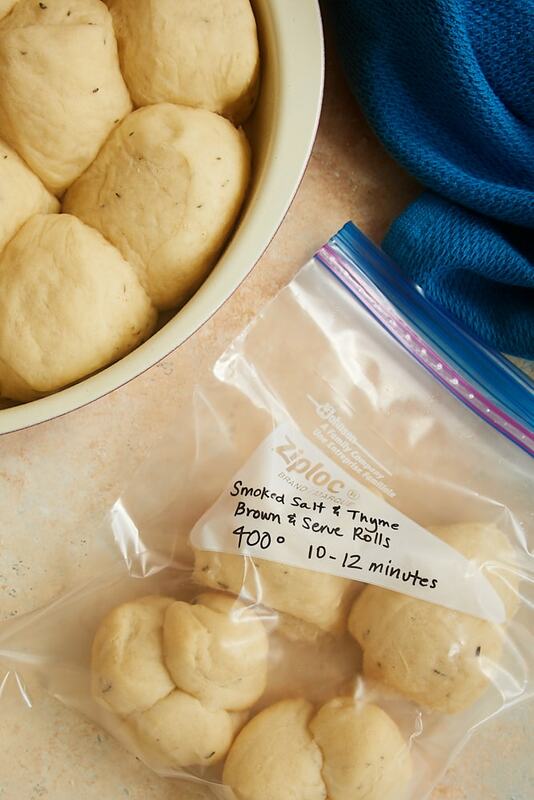 Homemade brown and serve rolls were never so good as these Smoked Salt and Thyme Brown and Serve Rolls. They are easy to make, and the taste is just wonderful! Combine 1 & 1/2 cups flour, yeast, sugar, salt, and thyme in a large mixer bowl. Place the milk, water, and butter in a small saucepan. Heat to very warm (120°F to 130°F). It’s fine if the butter isn’t completely melted. Add the milk mixture to the flour mixture. Beat for 2 minutes at medium speed of an electric mixer. Scrape the sides of the bowl as needed. Add 1 cup of flour, and beat at high speed for 2 minutes. Scrape the sides of the bowl as needed. Stir in enough of the remaining flour to make a soft dough. Transfer the dough to a lightly floured surface. Knead until smooth and elastic. (This should take 8-10 minutes.) Cover and let rest for 10 minutes. For classic dinner roll shapes, divide each portion of the dough into 12 equal pieces, shaping each into a smooth, round ball. Place them in a greased 9-inch round cake pan or greased standard muffin pan. For cloverleaf rolls, divide each portion of the dough into 36 equal pieces. Place 3 pieces per cup of a standard muffin pan. Preheat oven to 275°F for 20 to 25 minutes, or until the rolls have just changed in color. Cool in the pans for 20 minutes. Then remove from the pans to a wire rack to cool completely. To serve, preheat oven to 400°F. Place the rolls on a baking sheet lined with parchment paper or a silicone liner. Bake 10 to 12 minutes, or until golden brown. 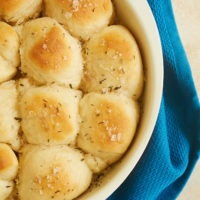 Optionally, brush the tops of the freshly baked rolls with melted butter (about 2 tablespoons for all 2 dozen rolls) and sprinkle with a bit more salt and thyme.